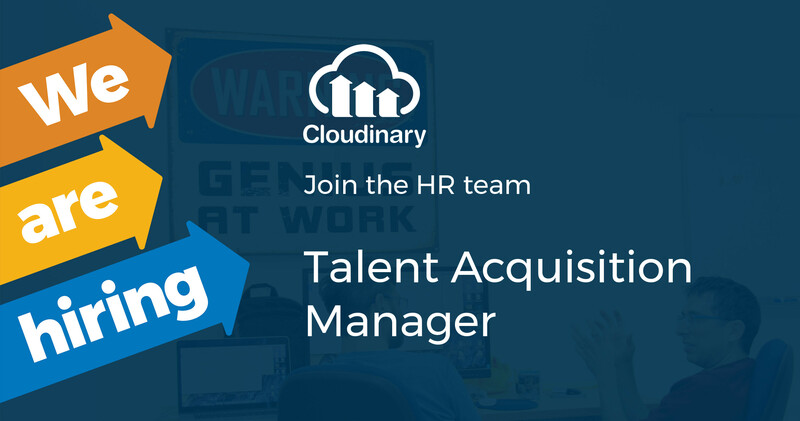 At Cloudinary we believe that talents are our most valued asset and as such, hiring the right people is one of our most strategic missions. Our Talent Acquisition team is tasked with bringing in top-notch employees that impact our technology, business, and company culture. As our Talent Acquisition Manager, you will be in charge of attracting and hiring the best talent in a highly competitive market. You will be a true trusted partner to our leadership and hiring managers, provide advice and guidance in all aspects of Talent Acquisition efforts and help us build excellent teams and culture. What Will Your Job Look Like/ What You'll Do? Manage, coach and develop a growing Talent Acquisition team. Execute our yearly hiring strategic plan, on time and in high quality. Responsible for leading the full life cycle of the hiring process and make it the most effective. Interview, evaluate and decision making while hiring new people. Design and implement the best-in-class recruiting plans and strategies that scale, to attract talents that aligns company priorities. Identify, integrate and manage all recruiting related vendors and tools. Develop strong and effective partnerships with the hiring managers, management and relevant vendors. Loves recruitment and lives and breathes it, and sees it as a significant and strategic profession! 8+ years of recruiting experience within high-growth, innovative, tech global organizations. 3+ years of experience managing and inspiring a high-performing recruiting team. In-depth knowledge of the full-cycle recruitment process. Experience conducting face to face interviews and excellent assessment skills. Passionate about candidate experience, ensuring that each candidate, regardless of hire, has a unique and positive experience. Strong understanding of talent acquisition strategies and the ability to influence and partner with business leaders across the organization. Experience working with Applicant Tracking Systems (Prior experience with Comeet preferred). Self-starter who loves taking initiative and proactively provide suggestions for how to streamline and improve recruitment activities. In-depth familiarity with the local technology ecosystem and networking in the relevant content world.